The Beats are lightweight data shippers, written in Go, that you install on your servers to capture all sorts of operational data (think of logs, metrics, or network packet data). 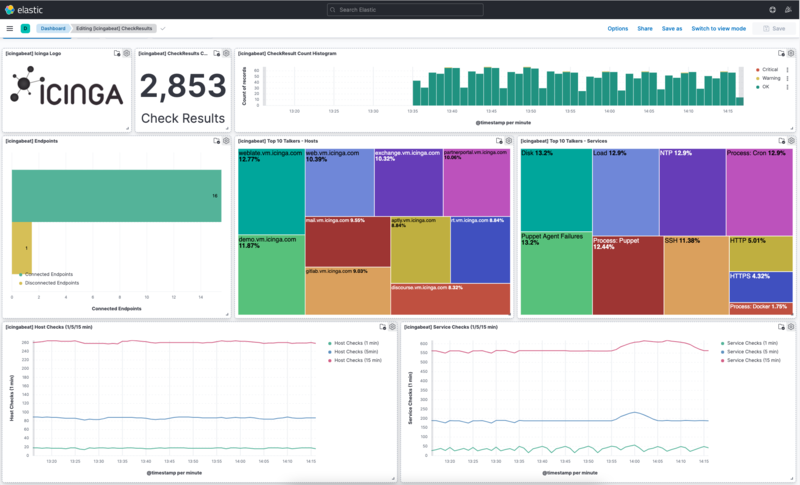 The Beats send the operational data to Elasticsearch, either directly or via Logstash, so it can be visualized with Kibana. Icingabeat listens to an eventstream published by the Icinga 2 API. This stream includes detailed information about events, such as checkresults, notifications, downtimes, acknowledgemts and many other event types. There is no polling involved in this mode. The configuration section describes how to limit the amount of data you receive by setting types and filters. The Icinga 2 API exports a lot of information about the state of the Icinga 2 daemon. Icingabeat can poll these information periodically.